Shaolin monastic tradition is often misunderstood around the world by people who are not exposed to sufficient knowledge of the inner-workings of the temple, including those of other Buddhist circles, even in China. The following is an attempt to make Shaolin monasticism and discipleship a little more clear, responding to some common accusations. To begin, there are two main divisions in Shaolin monasticism that should be understood- that of scholarly monks (Chin. : wénsēng 文僧) and that of warrior monks (Chin. : wǔsēng 武僧). The warrior monks are often mistaken as fully ordained Buddhist monks (Chin. : héshang 和尚) from where stems the confusion. The confusion is often the source for accusations of Shaolin monks being false for not upholding the Buddhist monastic codes. However, as we are trying to make clear here, the term "Shaolin monk" cannot be taken as reference to only the fully ordained. It is rather an umbrella term for all monastics within Shaolin tradition. "Scholarly monks" is another name for the fully ordained Buddhist monks. 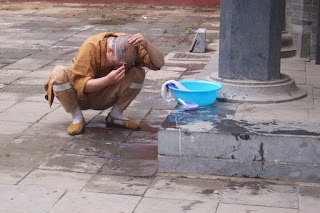 In China, to become a fully ordained bhikshu, a monk (Chin. : bǐqiū 比丘/ héshang 和尚) or bhikshuni, a nun (Chin. : bǐqiūní 比丘尼/ nígū 尼姑) one must take the full Pratimoksha Precepts (Chin. : biéjiětuōjiè 别解脱戒), consisting of at least 250 precepts for the monk and 348 for the nun. In addition, one must take the Bodhisattva Precepts (Chin. : púsàjiè 菩萨戒), consisting of 10 major and 48 minor. One cannot become fully ordained in Chinese Buddhism without taking both sets of precepts. However, it is the Pratimoksha that officially ordains someone in all Buddhist traditions. The Bodhisattva Precepts are just a requirement for Chinese monasticism. This is where Shaolin tradition differs. There is a type of monastic who is not fully ordained. The warrior monks are unique to Shaolin and only take five lay precepts (no killing, no stealing, no sexual misconduct, no wrong speech, no intoxicants). However, there are exceptions. While on temple grounds they observe ten precepts, with the precept of no sexual misconduct upgraded to full celibacy. The warrior monks in Shaolin tradition are considered monastics because they often live and practice in the temple. They differ from the secular disciples (Chin. : sújiādìzǐ 俗家弟子) who live at home. Warrior monks are like secular disciples who have "left home" (Chin. : chūjiādìzǐ 出家弟子). The level of their precepts makes them secular, but their position in the temple makes them monastic. This is unique to Shaolin, hence the common confusion. In other traditions they are seen as secular Buddhist gongfu masters who are trained under the guidance of fully ordained monks. This is often times unknown to many which creates controversy. The most common accusations are of the warrior monks breaking precepts such as of not eating meat. However, this precept is found in the Bodhisattva Precepts which is a choice for laity. Warrior monks do not necessarily take them. Furthermore, the Pratimoksha Precepts are those which make one fully ordained, and when broken have more strict punishments depending on the degree. Meat eating, however, is not found within this set of precepts, and therefore would not result in expulsion. Regardless, for one who has not taken such a precept of vegetarianism, there can be no punishment. The other main accusation is of breaking celibacy precepts. For the fully ordained, breaking this precept is called "defeat". One is immediately excommunicated from the Sangha and cannot reordain in this lifetime. This requires no decision to be made by the elder monks. It is automatic. Again though, this is in the Pratimoksha Precepts, which the warrior monks do not receive. Although they are considered monastics in Shaolin tradition, the level of their precepts is still secular. Many have had families. Ven. Shi Suyun (Chin. : Shì Sùyún 释素云 1913-1999), during a period of chaos in China, like many monastics had to return to regular home life. He had several children during this time. His son later ordained in Shaolin Monastery as well. All other confusions can be cleared up by taking a look at the precepts taken at each level. Now that the distinction between scholarly monks and warrior monks in Shaolin is clear, hopefully this will recover some of Shaolin's lost reputation due to the lack of available knowledge concerning the issue of precept levels. There are both scholarly and warrior monks in Shaolin. The warrior monks train in traditional Shaolin Warrior Skills (martial-arts) or "Wugong" (Chin. : Shàolín Wǔgōng 少林武功), while the scholarly monks focus more on monastic study and practices. However, the scholarly monks can, and some do, study wugong to various degrees, and the warrior monks do not only study wugong. All in Shaolin must first study Buddhism. A warrior monk can study Buddhism at the same time as training wugong , but Buddhist study and participation in monastic rituals is an absolute must for any. After all, Shaolin is not a martial arts school, but a Buddhist monastery. Shaolin monasticism and discipleship is a little more complicated than just this. There are several levels with differing precepts. The following is a basic overview of Shaolin monasticism. 1. Fully Ordained Monks take the full Pratimoksha Precepts and Bodhisattva Precepts. 2. Warrior Monks take the Five Lay Precepts and observe Ten while on temple grounds. 3. Young Novice Monks and Novice Monks take the Ten Precepts. 4. Monk Students take the 48 Vows. 5. Secular Disciples take the Five Lay Precepts. 1. A Scholarly Monk being fully ordained can take all lower levels. 2. A Warrior Monk can take Secular Disciples, Apprentices (Chin. : túdì 徒弟), and Ordinary Students. Due to their level of precept being secular, they cannot ordain any higher levels. Sad to tell it, but I have met two Shaolin wu-seng, who said that they did not even take the five precepts. 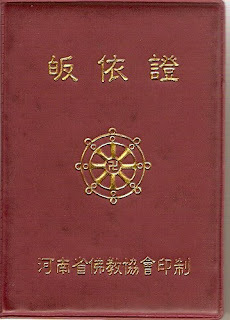 In any Buddhist tradition the minimum for becoming an "official" Buddhist is to "take refuge in the Triple Gem" (Chin. : guīyī sānbǎo 皈依三宝) and "receive the Five Precepts" (Chin. : shòu wǔjiè 受五戒）. This is called "Entering the Buddhist Gate" (Chin. : rù fómén 入佛门). Without this one cannot be considered "Buddhist", as they have yet to enter that gate. The information in this article is based on the Buddhist tradition in Shaolin Monastery. I understand nowadays there is much confusion regarding the true practice. However, one cannot become an "official" Buddhist as a member of the laity, much less a warrior monk, without taking refuge and receiving the Five Precepts as the bare minimum. What you just explained was not unclear before. I am talking about nowadays real contradictions, that you meet inside Shaolin monastery. But probably that's going too far.. Anyway, your article is surely a big step in correcting the pink image of Shaolin monks towards a more realistic one. Yes, I'm aware there are many actors. That will come with the fame of the temple. I believe a lot of it has to do with the state of poverty in Henan province, as the poorest province in China. Zhengzhou has (or had) the highest AIDS rate in China, because many people sell their blood to eat, and there are also prostitution problems. One thing they have is a temple world famous for martial arts. Of course they will cash in on it, although some may get carried away. So, at the same time I understand them, and must take compassion. However, behind all of that there are still active lines of transmission- traditional monks who have followed an unbroken lineage of Chan. Hopefully, this article can be a guideline to understanding the Shaolin monastic tradition and viewing the various personalities therein. Shaolin often catches a bad rap for the actors you see, but that doesn't hurt the case for those who know the truth. The true tradition will continue to spread. Thanks for your contribution here. I hope you can find something useful. I was told that there has not always been this differentiation between wen-seng and wu-seng, that it started with the time of “Mr. Mao". Do you know anything about that? Correct, there has not always been a class of Wuseng in the temple. The tradition has been recently revived, but the origins are much older. I will dedicate an article to this in the History section later to explain more fully. Thank you for the new article idea. "Shaolin often catches a bad rap for the actors you see, but that doesn't hurt the case for those who know the truth. The true tradition will continue to spread." I am so glad I could learn about these. Thank you for posting. Amitoufo. Thanks for writing this article. But can a Shaolin monk be considered a true Shaolin warrior monk if he does not obey the 5 precepts? I mean what makes a true warrior Shaolin monk? Of course not! One cannot even be considered a Buddhist without observing the 5 lay precepts, much less any level of "monk". A warrior monk's precept level is secular, but they must have undergone the Buddhist refuge ceremony and taken the 5 lay precepts at the very least. Wow great articles on this confusion. I used to have same confusion about this and I thought how come Buddhist monks i.e. Shaolin Monks are Buddhist they fight or something like that.